In the half-century before the Great Famine that started in 1845 there had been a rapid increase in the population of the country, the vast majority of whom lived in the countryside as farmers or landless agricultural labourers. Their farms were rented from landlords many of whom did not live in the country but left the management of their estates to agents. As families grew it was the practice to subdivide the land so that holdings got progressively smaller. Many families supplemented their income by domestic linen weaving. However, with the development of mechanisation and the growth of factory complexes this source of ready money dried up and made the people more dependant that ever on the productivity of the land. Dependence on the potato left families vulnerable to famine and there were a succession of these over the years although none of the severity of the one that started in 1845. With the increase in population, and the dependence on the land for sustenance, there was increasing competition for land. This competition made it easier for landlords and agents to increase rents. It also reduced the incentive for landlords, many of whom had no interest in the condition of their tenants and saw their estates merely as cash cows to be exploited, to improve the land eg through drainage etc. Indeed any tenant who made such improvement was rewarded by having his rent increased. The result of this short sighted policy led to the deterioration of the land and the reduction of its ability to feed an ever growing population. With the exception of Ulster, land holding was at the sole discretion of the landlord and tenants could be deprived of the means of feeding and sheltering their families at his whim or that of his agent. In Ulster a system, known as the "Ulster Custom" provided some security of tenure and other benefits. The custom was not a legal right but was widely respected. Under it, tenants, provided they paid their rent, had fixity of tenure, a fair rent and freedom to sell their tenancy. These were the "Three Fs" that dominated debate on the land question throughout Ireland until the end of the first decade of the 20th century. Not all landlords and agents in Ulster respected the Ulster Custom and there was a wide variation in its application - eg what is a "fair rent"? From the early 19th century South Armagh saw much agrarian disturbance, much of it between farmers in relation to land use. Much of the land not fenced. Animals could wander freely and damage crops. Land holdings were often not contiguous and the boundaries between neighbouring holdings not clearly defined. Also, landlords would sometimes redraw boundaries, reallocating land between tenants and causing resentment between neighbours. Disputes were inevitable and were often "settled" by violence, sometimes lethal, and usually after drinking sessions at local fairs. As recorded by Kevin McMahon in his article Agrarian Disturbances around Crossmaglen, 1835 - 1855 1, in that period at least 25 murders were committed within ten miles of Crossmaglen - in Counties Armagh, Louth and Monaghan. Of these, three were sectarian murders, eight were "common" murders and 14 were agrarian, or land related, murders. In addition there were at least three agrarian murder attempts and hundreds of serious agrarian disturbances involving assaults, burnings, conspiracies, shootings and threats. In the early part of the century the people had become more and more dependent on the potato as their main diet. Cereal crops were used to pay the rent and bad harvests drove many into debt and rent default. In 1845 there was a partial failure of the potato crop due to blight. In 1846, the conditions worsened leading to total failure for several years. The people were reduced to penury, and, particularly in the west and south of the country, many perished from disease and starvation. By 1851 a million and a half people had emigrated, many to Canada and the USA, some to Australia. Thousands died on the journey, which often lasted for weeks, crowed in dark and foetid conditions with inadequate food, water and medical care. Many more thousands perished within days of reaching their destination and are buried beside the sea and waterways that brought them there. In some parts of the country landlords took the opportunity to clear the land by assisting emigration, as, after the famine was over, did some of the Poor Law Unions whose job was to feed the destitute. Desperate to reduce the number of orphans who were in the workhouses, there was an official policy, broadly executed, to ship them to the colonies, Australia in particular. Government response to the crisis was slow and inadequate, and the system of levying the cost on the local ratepayer was much resented and resisted, especially by those landlords, some of whom were members of the Poor Law Guardians, whose income from their tenants had been much reduced by the famine itself. Although the effects of the famine were not as severe in Ulster, or in South Armagh, as other parts of the country, there was much destitution and hunger. See "The Famine in Creggan Parish" by Mary Cumiskey, published by the Creggan Local History Society in 1998. This gives a graphic account of the condition of the two parishes of Upper and Lower Creggan in the decades before the Famine and of the development of the disaster and the official response to it. Not all landlords acted with the callous disregard or indifference to the suffering of their tenants of so many of their colleagues and there were many examples of landlords spending a considerable portion of their assets on their relief. However they were a minority. Many of the estates were burdened with debt and in 1849 the Encumbered Estates Act provided for the sale of such estates. However, its effect was to encourage speculative investment leading to higher rents than before. The Famine marked the beginning of the end for the landlord class in Ireland although it was not evident at the time. In 1850 the Irish Tenant League was formed with its main emphasis being on the legislative extension of the "Ulster Custom" - the "three Fs" to the whole country. The violence of the Fenian movement led many British politicians, especially William Gladstone, to consider Irish land reform. The first act in the movement to the eventual transfer of the land from landlord to tenant was the Disestablishment Act of 1869 which brought an end to state support for the Church of Ireland. Part of the process was to grant loans to the tenants of church lands to buy out their holdings. Over 6000 tenants did so. Tenants be lent two-thirds of the purchase price to buy out their holdings. The money to be repaid over 35 years at an interest rate of 5%. However, as very few tenants had the necessary capital the Act was largely ineffective and less than 900 people benefited from it. In the 1870's a successions of bad harvests and the reappearance of the blight renewed fears of famine. At the same time the demand for Irish farm produce in England was being eroded by cheaper imports from a burgeoning farming industry in the USA. This reduced the ability of tenants to pay their rent leading to widespread evictions and agrarian disturbances. In 1879 Michael Davitt and Charles Stewart Parnell established Irish Land League to fight tenant evictions and campaign for the "three Fs". The League organised throughout Ireland and was so successful that it forced the Gladstone's government to introduce reform.The League was suppressed in 1883. The 1881 Act offered the "three Fs", three quarters of the purchase price repayable over 35 years and set up the Lands Court. The 1882 Arrears Act gave money to tenants to enable them to pay off money owed. The 1883 Labourers Act provided money to build labourers cottages. The 1885 Ashbourne Land Act provided �5 million for land purchase, and granted tenants the entire purchase price to be repaid over 49 years at 4%. However the Act did not allow for compulsory purchase. The scheme was popular and additional money was granted - leading to over 25,000 tenants buying the land. The 1891 Balfour Act advance another �33 million on the same terms of the Ashbourne Act, enabling another 47,000 tenants to purchase their land in the period to 1903. In 1902 representatives of landlords and tenants met to investigate the possibility of an agreed solution of the Land Question. They agreed a basis of long term purchase that would secure the landlords against loss and assure tenants their land at a fixed annuity lower than the actual rent. George Wyndham, Chief Secretary, accepted the recommendations and brought in the Land Act of 1903. This provided �100 million for land purchase. Landlords were encouraged to sell and the advance to tenants was for the full purchase price at 3.25% over 68 years. Some 200,000 tenants made use of the provisions and acquired their land. The 1909 Birrell Act introduced compulsory purchase. 61,000 tenants benefited from this Act. Thus by 1909 the power of the landlord in Ireland was finally broken. By 1921 two thirds of the land in Ireland had become the property of Irish tenants. South Armagh did not escape the agrarian struggle which continued throughout the period of land reform. In his article The Cornonagh Evictions" 2, Len Gould recounts the story of the 1888 eviction of eleven tenants in that townland after many failed attempts to reach agreement with an unyielding landlord and his bitter agent. The flight from the land that started during the famine continued in the decades after it ended. 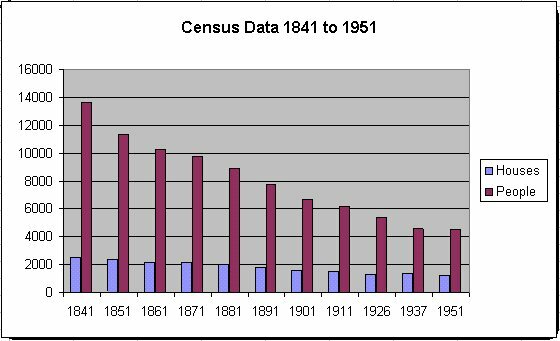 In Creggan Parish the total population dropped from 13,603 in 1841 to 5,249 in 1935, rising slightly to 5,252 in 1951 (a reduction of 61.4%). That the reduction was continuous can be seen from the graph. The Famine ended the practice of subdividing the land and younger sons were expected to find work elsewhere. In the absence of any economic development this usually meant emigration, either to Great Britain to work on the railways and canals, or to America and Canada. This trend is reflected in the reduction in household occupation, which decreased from 5.4 per household in 1841 to 3.4 in 1935. These partings were emotional affairs since those who went and those who stayed knew that for most of them it was a final goodbye and that they would never see each other again. "American Wakes" were held to see off the exiles. Most of those who went did not do so to build a better life for themselves but because they could see no way to build a better life in their homeland. "The Passing of the Gael", a poem by Eithna Carbery, captures the mood perfectly.